Check out the full Terms & Conditions archive. Launched in 2008, Evernote started as a “productivity tool.” But it has since grown into something much more — a virtual extension of your brain. For those of you not yet in the know, Evernote allows you to store nearly anything you want to remember — photos, receipts, Web pages, recipes, voice recordings, you-name-it — and access those “memories” through a mobile app or on the Web. You can also share “notebooks” with whomever you like. It’s quite handy, especially if you live a busy, active life, with plenty of stuff you want to remember. To learn more about what exactly Evernote means about all this, you can read this extremely explicit, clear, and downright encouraging blog post from Evernote CEO Phil Libin. While helpful, these points don’t quite tell the whole story. Here’s the rest of what you should know about Evernote’s ToS. Evernote kicks off its ToS with a “Use of Service” section, a dense paragraph that basically says that if you discover any “unauthorized use” of your account, you have to tell Evernote about it. And if you don’t, the company is not responsible if someone steals or deletes your data. One curious portion of the “Use” section is that you must be “of legal age to form a binding contract” to use Evernote, which in the U.S. means you technically have to be 18-years-old to sign up. Google also has this provision in its terms, meaning anyone under 18 can’t use any Google products. In reality, of course, no company pays much attention to this rule. And Evernote later explains that you can use the service if you’re over 13-years-old. So don’t fret, teens. You may be breaking the law by using Evernote, but nobody cares. Evernote has the fantastic policy that you own the rights to everything you upload to its service, and the company promises not to use your stuff to make money. Further, if you decided to ditch Evernote, you can take all of your data with you. That said, you are on your own if you upload (and share) copyrighted content and get served with a lawsuit — Evernote will not help you in any way. If you contact Evernote with some ingenious way to improve the product, Evernote may (or may not) use the information you provide however it sees fit, be it for marketing material, or to tell the world about what dumb ideas you have. (Kidding!) It also automatically owns that idea. So if you come up with something brilliant, don’t just email it to the company willy nilly. 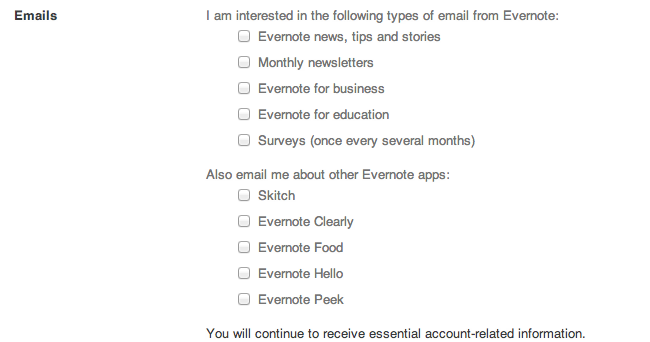 If you find anyone doing any of these activities listed above, you can rat them out to Evernote. Evernote uses some other third-party institutions to do business (like server providers, banks, etc), and your account information may be passed on for general business purposes. Evernote may make changes to its services at anytime, so don’t freak out like a Facebook user if that happens. Evernote may serve you ads sometimes. If you click them, any data you provide is between you and the advertiser. I reached out to Evernote for comment on this story, but they were not able to get back to me straight away. I will update this space as soon as I hear back.